Pteranodon was a large pterosaur from the Late Cretaceous Period, around 85 million years ago. Despite often being grouped with dinosaurs, pterosaurs were a separate but related group of flying reptiles. While they did not have feathers like birds and some dinosaurs, some pterosaurs were covered in hair-like structures called “pycnofibers”. Characteristics: Though pterosaurs flew, this Pteranodon figure is posed at rest on the ground, showing off its large and dynamic crest. It was long debated whether pterosaurs walked using two legs or four, until pterosaur tracks were discovered indicating a four-legged walk. 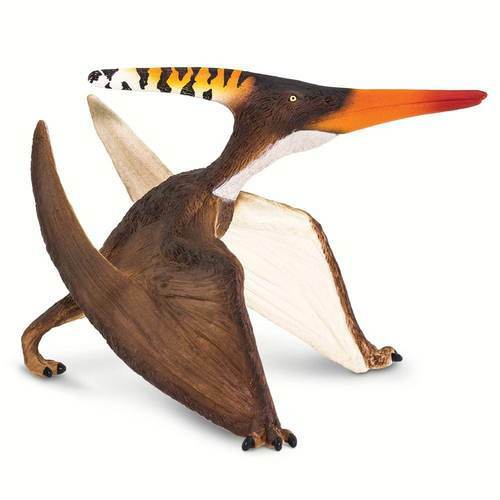 Size and Color: This at-rest Pteranodon figure is about 3 ½ inches high and 4 inches in length, about the size of a muffin (though much less tasty…don’t eat it). Its body is brown above and cream colored below, with black claws on its hands and feet. Its bill is orange with a red tip, and its crest is a vibrant orange with black markings. Tags: 2019, Pteranodon, safari, wild safari.